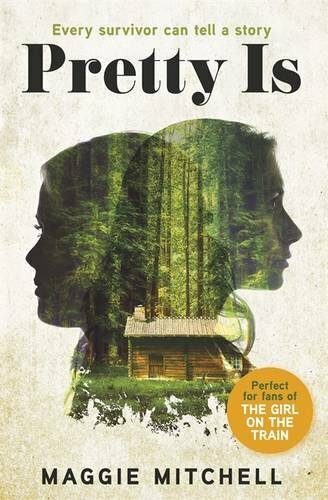 Identity, memory, self-worth and desire - all are at the core of Maggie Mitchell's beguiling novel Pretty Is. When Carly May and Lois were 12 years old they were kidnapped. Missing for two months, everyone presumed they were dead, until they were rescues. Now grown up, Carly May has changed her name and is pursuing an acting career, while Lois has written a book fictionalising what happened to the two girls during the time they were kidnapped. When Carly May is cast in the lead role of the film adaptation of Lois' book, the two women are brought back together again. What really happened to them when they were 12, how has it affected them, and is there still a threat to their lives? In Carly May, known as Chloe in the present time, and Lois, Mitchell has created two complicated female characters who I spent the entire book trying to unpick, and who spent the two months they were kidnapped trying to unpick each other, and the years since then trying to both forget each other and make sense of each other. It's easy to think that it was just the kidnapping which affected Carly May and Lois so badly, impacting on the rest of their lives, but Mitchell shows through glimpses of their home life that the kidnapping only exacerbated the girls' feelings of otherness and exclusion, that feeling that maybe there was something special about them, and that's why they never fit in, and that's why they were chosen by their kidnapper. Because that's what makes this novel unusual, and not your traditional story about the aftermath of a kidnapping on a victim or victims - Carly May and Lois' feelings towards their kidnapper are complicated. It's not quite Stockholm Syndrome, I don't think, but the kidnapper provided something in their lives they thought was missing before, something they desired, and at the same time didn't quite give them the feeling of validation and purpose that they needed as children, and that, for Lois primarily, is still missing as an adult. The complicated relationship between Carly May and Lois, and between them and their kidnapper, is made more difficult to work out by the structure of Mitchell's novel. The opening section switches between the two women (with Carly May quickly changing her identity to Chloe) as they reflect on what happened to them, and give an insight into their current lives and the circumstances that are about to bring them back together. The second section is then part of Lois' book Deep in the Woods - the fictionalised version of the kidnapping. And then for the final section we switch back to Lois and Carly May in the present time as they finally meet again after many years. The three sections offer the reader different perspectives of the two women, and show the many different layers to their memories of the two months they were held. We also get a sub-plot in Pretty Is, in the form of a student who forms an obsessive, unhealthy connection with Lois. The student reminds Lois of her kidnapper, and the closer he gets to her the more unstable Lois becomes, at least in my opinion. The student forces Lois, and eventually Carly May, to confront what happened to them as 12-year-olds. Pretty Is is a clever novel, one that doesn't offer easy answers or a tidy conclusion. It's got two unusual, twisted heroines who you'll pity and love, and who you'll spend ages trying to work out, long after you've finished the book. *Pretty Is is released in the UK on July 16, 2015.